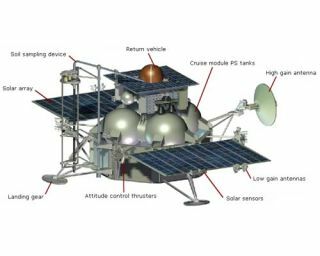 Russia's Phobos-Grunt is designed to land on Mars' moon Phobos, collect soil samples and return them to Earth for study. The lander will also carry scientific instrumetns to study Phobos and its environment. It will travel to Mars together with Yinghuo-1, China's first mission to the Red Planet. Russia's Phobos-Grunt spacecraft, designed to collect samples from Mars' moon Phobos, is still stranded in Earth orbit. The probe, launched Nov. 8, failed to fire its thrusters on a course toward Mars and now is likely to fall back to Earth as a piece of space debris sometime early next year, experts say. The Phobos-Grunt spacecraft is also carrying a small payload from the Planetary Society, a nonprofit space advocacy group, to test the effects of microgravity on tiny organisms. Here David Warmflash, the science lead for the U.S. team of the payload, called the Phobos Living Interplanetary Flight Experiment, shares his thoughts on the path forward for the Phobos-Grunt team. With the decision by the European Space Agency to resume tracking Phobos-Grunt this week, after calling off tracking last Friday (Dec. 2), the story of this unpiloted spacecraft remains a cliffhanger. Last week, the probe was said to have shown signs of uncontrolled tumbling, yet reports in recent days suggest that its attitude control may now be working. Even so, unless Phobos-Grunt not only can be contacted, but can be made to accept commands to boost its orbit, the spacecraft will reenter the atmosphere in early January. The craft will disintegrate as friction from the thin air of Earth's outer atmosphere ignites the 12 tons of fuel that was to propel it to Mars. As news of the pending failure of Russia's first attempt to reach the Red Planet since 1996 spreads globally, some are concerned that this will spell the end of Russian interplanetary exploration for years to come. Some statements out of Russia during the last few weeks have placed the blame on engineers and scientists at the Russian Federal Space Agency (Roscosmos), while comments by various space experts allude to problems at the agency without blaming the engineers themselves. For one thing, Alexander Zakharov, the Grunt mission scientist who was instrumental in getting the Planetary Society's Living Interplanetary Flight Experiment onto the spacecraft, has suggested that the team would like to repeat the mission. The history of spaceflight, both at Roscosmos and NASA, is full of failures leading to technical improvements and eventual success. I'm confident that officials at Roscosmos will listen to Dr. Zakharov and others echoing him. The program will go on, and someday soon, I predict, a probe will land on the Martian moon Phobos, collect a sample and return it to Earth. In addition to providing engineering experience upon which controllers can draw the next time, a failed mission might also produce some limited scientific results. Because of the way that Phobos-Grunt is configured, it is possible that the vibrations and tumbling that will set in as the speeding craft begins interacting significantly with mesospheric air will dislodge the vehicle's most famous component — the return capsule that was to carry a 200-gram sample from the Phobosian surface back to Earth — sparing it a fiery death. Should this happen, the capsule might make a survivable reentry trajectory, miss the oceans, and come down on land, just as it was designed to do. Missing from the capsule, of course, would be the grand prize of the mission, the Phobos sample that was to be scooped up by a robot arm. The arm is part of the Grunt interplanetary module, the stage that was to set down on the tiny moon to collect the sample and also deliver an enormous suite of scientific instruments. At about $150 million, this instrument package is really the heart of the spacecraft's science payload, less famous than the sample return capsule, but daunting in its capabilities. Designed to probe the structure of Phobos with lasers, neutrons, gamma-rays and other tools, the interplanetary probe was meant to elucidate how this little world and its companion satellite, Deimos, formed. Similar to the instrument package that NASA's Mars Science Laboratory (MSL) Curiosity rover is now carrying to Mars, the Grunt interplanetary probe is designed to analyze dirt in terms of mineralogy and chemistry, including the search for organic matter, the stuff of life. Also included in the Grunt science payload are instruments for conducting geophysical studies on Phobos and celestial studies from its surface. While tests by the interplanetary module could have continued on the Phobosian surface long after the departure for Earth of the return capsule, analysis of the 200-gram sample to be returned might have revealed that it included dust particles from Mars. Phobos-Grunt is also carrying a Chinese probe, Yinhou-1, that would have orbited and studied Mars for two years. It appears that Russia's Phobos sample-return mission will not be successful this time, though I hope that ESA's renewed communication efforts could still change Phobos-Grunt's ultimate prognosis. But even if it does not work, all the ideas and designs for it are already in place, and another try could be made as soon as the next launch window to Mars opens, 26 months from now. Meanwhile, should an empty Grunt return capsule make its way back from space next month unharmed, the LIFE biomodule could be opened. Designed to test the possibility that organisms in rocks ejected from Mars might survive a trip through space to seed the early Earth, LIFE was piggybacked on Grunt so that the organisms packed inside it would experience all of the effects of spaceflight. While such effects include the radiation environment that exists beyond the Van Allen Radiation belts that surround Earth, which Phobos-Grunt won't experience if it never leaves Earth orbit, the experiment could still have value. An undamaged LIFE biomodule would constitute a 2-month biology experiment in low Earth orbit. Many such experiments have flown in low orbits during the last few decades, which is why we wanted an interplanetary mission. Even so, LIFE contains 10 species, representing all three of Earth's domains of life. Some of the LIFE species have never been flown in space before, plus there is a collection of mixed microorganisms in a soil sample from Israel's Negev desert (a Russian experiment). Thus, while not as useful scientifically as it would have been after going to Phobos and coming back, a returned LIFE biomodule would have some scientific worth. Also, by opening it and finding that the organisms are viable, we'd confirm what we know to be true theoretically, that the organisms and the biomodule can survive a hard landing. This would make our experience with the next Phobos-Grunt mission all the easier. David Warmflash, M.D., is an astrobiologist and science lead for the U.S. team of the Planetary Society's Phobos Living Interplanetary Flight Experiment.